Patt Baldino is a gifted artist whose award winning work have been widely exhibited throughout the United States. 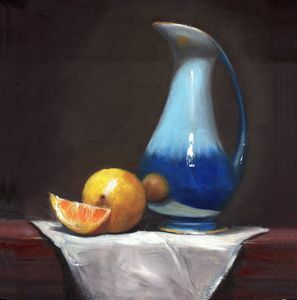 Dramatic oil still lifes reflect her impressive technical skills and keen eye for composition. A pinpoint of light on a glass or a play of shadows in her rich palette invites us to explore her work in greater depth. After graduating from the High School of Art and Design, Patt received a BFA from the School of Visual Arts in New York city. Studied at Grand Central Atelier, Art Students League and National Academy School of Fine Arts. She also studied a year and half with floral painter Michael Klein. Patt paints her florals and still lifes in oils. Her paintings have been juried into international shows including Oil Painters of America, International Guild of Realism, Salon International to name a few. Patt has was many awards over the years and in 2018 she was awarded the Betty Kaytes Floral award from Ridgewood Art Institute and Honorable Mention at the Salmugundi Club Exhibition. Her work can be found in private collections throughout the United States.